Had some major storms go through this area last night. The first one just missed us to the North. We had a bunch of us sitting on the boat waiting for it to hit. Nothing like a storm while sitting on the boat at the slip. Lake trout fishing is still strong with regular limit catches. 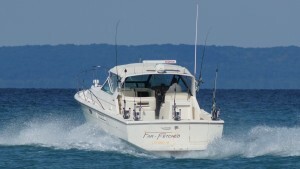 The fish we are catching are the new lake trout and most people prefer this fish for table fare. I did troll straight spoons for about an hour a couple days ago with no luck on any silver like fish. Other captains have had the same outcome. My phone is ringing so why not give us a call and get on our calendar.